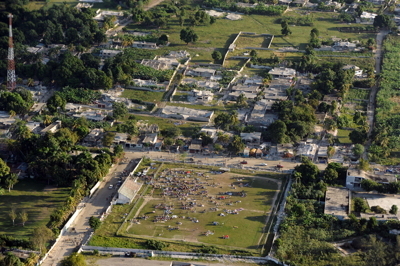 Coast Guard C-130 Hercules fixed-wing aircraft crew from Air Station Clearwater, conducts an overflight assessment above Port-au-Prince, Haiti, January 13, 2010. Five years after a 7.0 magnitude earthquake devastated Haiti, there are signs of improvement. Lauren Hashiguchi, a policy translation specialist at the University of Washington’s Institute for Health Metrics and Evaluation, reports that there have been successful efforts to repair and strengthen the infrastructure. Industry is being rebuilt, and they are even making gains to improve health. Years of life lost to death and disability caused by the earthquake have fallen by sixty percent since 2010. The situation in Haiti is still troubling, however. Haiti is still the only country in the Caribbean where HIV/AIDS is the leading cause of death. While Haiti’s neighbors generally face non-communicable diseases affecting adult populations, Haiti’s top causes of death are dominated by communicable diseases and childhood diseases. The situation in Haiti reminds us that everything is interrelated. The combination of an earthquake, an already fragile economy, and widespread political corruption (many Haitians still wonder where all the money for reconstruction went) led to both short- and long-term misery. Haiti continues to rebuild, but it still suffers from the lingering effects of the quake on its citizens’ well-being. Does the gospel have anything to say to people in the throes of a perfect storm of natural and human-caused suffering? Romans 8:18-25 links creation—in particular, the dark and frustrating aspects of the material world we experience every day—with God’s ultimate salvation of God’s people. In fact, Paul says that creation itself groans as if in labor for something that is yet to be “born.” Believers also groan, perceiving that they are not yet what they will some day be. Passages like this remind us that God’s plan of salvation is not merely for individuals, but for all of creation. In some sense, the universe itself has been marred by sin and stands in need of redemption. Lauren Hashiguchi, “Visualizing Haiti’s New and Improving Health Landscape,” Humanosphere.org, 21 Jan 2015 http://www.humanosphere.org/science/2015/01/visualizing-haitis-new-improving-health-landscape/. • How do you envision the connection between disease, famine, earthquakes, and the like and human sinfulness? Are these calamities a divine punishment? A natural consequence of living in a fallen world? Something else? • How can Christians embrace the truth that Christ’s saving work has cosmic implications? • What would it mean to our faith and our witness to confess that salvation isn’t only—or even primarily—about individuals going to heaven when they die? God indeed condemned sin in the flesh and has ordered us not to walk in the ways of the world but in the ways of the Spirit. Yet he also understands that our bodies and spirits do not always work in harmony. Our bodies need to be conformed to the Spirit of God (8:3-11). To be led by the Spirit includes crying out to the Father for help and receiving the reaffirmation that we are his children, provided we are willing to accept the pain of living in the world (8:12-17). But such pain is only temporary and faithful servants learn that nothing can separate them from God’s love and his hold upon their lives (8:26-39). Gerald L. Borchert, “Romans, Letter to the,” Mercer Dictionary of the Bible, ed. Watson E. Mills et al. (Macon GA: Mercer University Press, 1990), 723. Paul means by this that the creation became corruptible. Why and for what reason? Because of you, O man!… The creation suffered badly because of you, and it became corruptible, but it has not been irreparably damaged. For it will become incorruptible once again for your sake. This is the meaning of in hope. In between the fall and future salvation the creation groans “in labor pains” (v. 22; Mark 13:8b). Likewise, Christians are groaning inwardly while we wait for our salvation (v. 23; cf. 2 Cor 5:4). This is described as “adoption” (omitted by P46, D, F, G, and 614), the “redemption of our bodies (cf. 7:24—this body of death).” First Corinthians 15:54 speaks about the matter thusly: “When this perishable body puts on imperishability, and this mortal body puts on immortality.” The whole person will be redeemed just as will the physical world. Of course, what Christians have already experienced can be called being “saved” (v. 24). Nevertheless, Paul also said we will be saved (5:9-10). This is our hope. There are a number of other expressions used in the Pauline letters for future salvation: for example, saved from wrath (1 Thess 1:10; Rom 5:9); being with Christ (1 Thess 4:17; Phil 1:23); inheriting the kingdom of God (1 Cor 6:10); being given eternal life (Rom 2:7); being transformed into the image of Christ (2 Cor 3:18; Rom 8:19). The multiple images refer to the one reality in the future just as multiple images like justification, sanctification, reconciliation, redemption, and salvation refer to the one reality in the present. Paul’s vision here includes a picture of humans as wholes together with their physical environment totally freed from sin and sin’s effects. In the meantime, we wait for our future salvation with patience (v. 25), a patience made possible by the activity of the Spirit. Charles H. Talbert, Romans, Smyth & Helwys Bible Commentary (Macon GA: Smyth & Helwys, 2002) 214–16.